This week's Blogger of the Week does have a name as well as her identity as Mom! Her blog is a great mixture of stitching and travelling as they "out-of-home school". I've certainly learned a lot since I started following her. Hello. My name is Katie. I'm a stay at home mother. I'm lucky enough to be happily married to my soul mate Fred. Our son is soon to be 19 named Jeremiah. He has a physical disability called Cerebral Palsy that affects his legs and makes him not be able to walk without assistance and only for short distances. I'm very close with my mom and we own a house together. Right now I have one dog named Izzy. She is a jack russell beagle mix and I love her dearly. I've always been a dog person and my dream is to have a fenced in yard and 7 dogs haha. We live in Indiana. I have my whole life. I love traveling though and we enjoy traveling as much as we can. Jeremiah has been home schooled most of his life so we museum, zoo, fort, and aquarium hop around the United States. I've always been crafty. My mom even owned her own craft business for most my life from teenager on. I always seemed to be doing something. When I went to the local store (like Hobby Lobby) I noticed the section with counted cross stitch was huge. There was a dragon design so I thought I should try it. I was in high school. I enjoyed it alot but it didn't catch up till after my son was born. Stitching gave me something to do while I was sitting with him. I always need something to do with my hands. Stitching was perfect. So I've been doing it pretty much everyday for his whole life, now 19 years. I started my first blog in October 2004. I switched to a different one and then back to blogger in 2007. I belonged to a lot of Yahoo stitching groups. I saw other blogs and thought it would be fun. I always wanted to journal but writing was so boring. Typing was perfect. So blogging was the perfect fit. When Jeremiah was at public school all the kids called me Jeremiah's Mom. It was honor to be called his mom. So what better blog name. My idea was to write it like I'm writing a letter to a stitching friend. I found a company that makes paperback books out of your blog. So at the end of each year I get my blog printed out. I love looking back and seeing what I stitched. Where we traveled. I'm a firm believer of it's my hobby and I should enjoy it. So I do whatever I want when I want to. If I want to work on this one. I will. If I want to start something. I do. I notice I tend to work on stuff for 3 days and then switch to something else. Sometimes. LOL So I guess the answer is I'm random definitely. Hm. This seems to change doesn't it. Right now I love monthly seasonal type stuff. But I also love animals. Fantasy like dragons and fairies. My mom LOVES beach stuff and our house has a lot of beach stuff so I tend to do a lot of beach/ocean stitching. Designs I enjoy are Erica Michaels, Stoney Creek, Hands on Designs, Heaven and Earth, and anything else I love the pattern it seems haha. This is my most proud definitely. Teresa Wentzler's freebie Stretch. It was the first Teresa Wentzler piece I did and the last now haha. Too many color blends, quarter stitches, and crazy amount of backstitching. I completed this before I started better record keeping so it was before 2005. I didn't know to sign the date. I wish I knew better. This one I'm very proud of too. It's my first finished HAED. It's called Pirate Dragon. I finished it in 2011. Even though it's a "quicky" it took me forever haha. I was so proud to finish a HAED. This Crescent Moon Dragon from Joan Elliott is another one I'm very proud of. I completed it in 2010. The 3 of these dragons hang proudly in my living room. Love them so much. I could talk about the pieces I'm proud of for days though so onto the next question. I was at a stitching gathering with a local group. We were all stitching together and my stitching bag was sitting beside me. A lady brought a full cup of tea into the room and accidentally dumped the ENTIRE cup into my bag. Luckily I had everything in ziplock bags and protected. But my heart skipped a beat that's for sure. I love speciality stitches. I need to try more of them. I have a HUGE pile of things that need sewing done to them. I love decorative pillows finishes. I got into a fight with my sewing machine a few months ago and haven't tried again. I really hope I can figure it out again. I've done it before so I should be able to. Yes, I have a large amount that need finished. I love the idea of making several of them into decorative pillows. Like this year I'm doing these monthly Pine Mountain Designs. I would like to keep the whole year in a basket and then display the current month on my seasonal display area. I have a local framing shop that is a LNS that does a fantastic job for a great price. So if it's an extra special piece I will get it framed there. All of them. I wouldn't do them if they didn't. I'm a free spirit and love all things I stitch. My life motto is No matter how bad it is...it could always be worse. It's got me through so many things. Even on the really bad days I know it would be worse. Thank you Jo for hosting this awesome blogger of the week. It's so much fun to see who's behind the screen of the other wonderful blogs out there. Thanks for allowing me to participate. I just came across this blog a few days ago. What a fun idea for a blog. Now I'll be following along with Jeremiah's Mom, too. Katie, there are some really beautiful finishes on this post. I can't wait to follow along and see all the beautiful things you stitch. Great to see you Katie. I have followed your blog for a few months now but it is great to hear more about you and some of your old projects. Love all the different dragons. It's been lovely to read about you, Katie and to see some of your favourite projects. How nice to meet you and you family. Wonderful stitching. 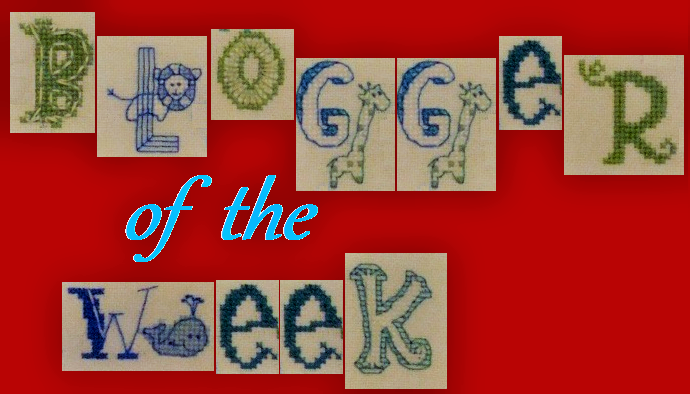 Congratulations Katie on being Blogger of the week. I know you from a couple of the CS groups and by your blog, I've been following it for a few years now. Another dragon lover. They are sure amazing aren't they? Thanks! Nice to meet you, Katie. I enjoyed seeing your dragons! So great to read your story!AriadnefromGreece! Thank you! LOL I don't blame you. It's saved me a few times now. Enjoyed learning more about you, Katie!! Thanks for sharing your stitching story! Lovely to read and learn more about you and your family Katie. Nice to meet you, Katie! Sounds like you have an interesting life with all that traveling. Your stitching looks awesome, I love the Crescent Moon Dragon! Thanks! I'm so thankful for getting to travel so much. I love the Crescent Moon Dragon too. I love how you chose your blog name, that is quite an honour! Of course I love ALL your dragons, I really need to stitch more of them. Don't forget to visit if you ever travel to MD! Thanks! I'll have to remember that. Would love to meet you. Lovely to read more about you Katie. Your blog is so chatty and it really does read like a letter from a good friend. I love all of your dragon pieces, well done on completing a HAED or two as well! Thank you. Only one finished right now. I have so many in progress though. Thank you! I'm glad people enjoy our travels. I enjoy writing about them. I love stitching on HAEDs. Thank you! I'm glad you enjoy reading about it. I love writing it. It was great to read all the bits and pieces about you and your stitching career, Katie. And I particularly love your answer to #4. For me it works the same way and I'm completely happy with it. Wonderful, the three dragons. You can definitely be very proud of them. Katie, it's really lovely to get to know you a little better. I love your Wentzler! I've done a few of hers, but I've given them all away. They are a challenge to stitch though. Thank you. Oh I can't imagine doing all that work and then giving them away. You are better than me.